Hundreds gathered in the city of Kohima to commemorate the 89th anniversary of the Naga memorandum which had been submitted to the British Simon Commission in January 1929 with the aim of achieving self-determination for Nagas and devolution from the Indian union. The event was a joint initiative of the Forum for Naga Reconciliation and the Angami Public Organisation and centred around inclusivity and reconciliation within the community. The event comes in the run up to the Nagaland assembly polls in February-March 2018 and amid ongoing peace talks between the Modi government and the Nationalist Socialist Council of Nagaland (NSCN). The event commemorates the historic day of 10 Jan 1929, when a memorandum was submitted to the Simon Commission seeking self-determination for Nagas. Festive fever gripped Kohima on Wednesday [10 January] as hundreds gathered at the Khuochiezie local ground to celebrate what was touted as the first ‘Naga Day’, aimed at forging unity among Nagas across borders. 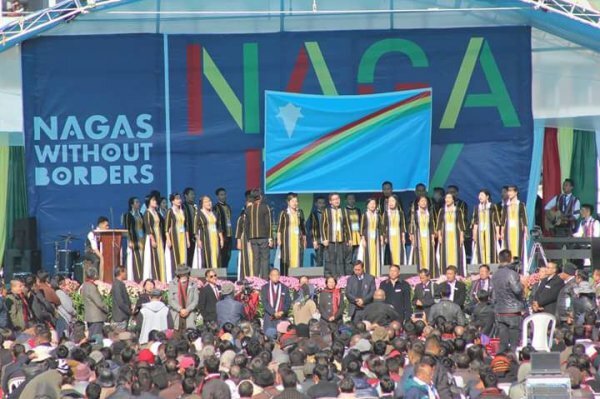 It was held to commemorate the historic day of 10 January 1929, when the Naga Club — formed in 1918 to push for Naga unity — had submitted a memorandum to the Simon Commission seeking self-determination and alienation from the Indian union. The event came days after Naga Hoho, an apex Naga tribal body, sought Prime Minister Narendra Modi’s help in postponing the forthcoming Nagaland Assembly elections, seeking an early solution to the insurgency problem. In 2015, the Modi government and the rebel group NSCN (I-M) had signed a framework agreement to end the insurgency. Wednesday’s event — a joint initiative by the Forum for Naga Reconciliation, a joint conglomeration of tribal, church and factional bodies, as well as Angami Public Organisation — however did not make any reference to the controversial Nagalim (integration of all Naga-inhabited areas) issue. Instead, Naga scholars talked about reconciliation across factions, tribes and borders given that Naga tribes are spread over four states in India’s Northeast as well as Myanmar. In the spirit of inclusion, special numbers were performed by Kuki artist Ellie Neikim Hangshing and Eastern Naga team, a singer duo representing Nagas from Myanmar. Nagas share old rivalries with Kukis in Manipur, who have clashed with them in the 1990s over territorial claims. The pressure for a peaceful solution to the Naga problem has been building up ahead of the Nagaland assembly polls, due in February-March. Amid the uncertainty of a political solution materialising either before or after the polls, the push for unity among various tribes is being seen as a positive development by civil society organisations in Nagaland. Meanwhile, Chief Minister T.R. Zeliang met Union home minister Rajnath Singh on Wednesday, and the two leaders discussed the Naga political issue. A statement from the Nagaland government said that Singh assured Zeliang that he would “convene a meeting on the demand of the Naga people”.